Happy Holidays! Yeah, I know, there’s no holiday this week but that’s not keeping us from holding the Melrose Running Club Holiday Party. Snow on January 7th moved cancelled our party so instead it will be held this Saturday, March 4th. Therefore we will march forth (see how I did that) with a 20 mile run on Saturday. For those that can make it, great! For those that can’t you could switch your 16 and your 20 milers around. Do 16 on your own this week and next week we’ll add an extra water stop in Melrose Center so you can tack on 4 miles to the 16 miler to get your 20 in. Last week we had about 45 runners partake in a warm February 18 miler through Breakheart and deep into Wakefield. Good weather, good run, and despite a little drama with a park ranger a good day overall. The Start of the Route: If you’re running short, 10 miles this week, you’ll head down Main Street to West Wyoming and turn right towards Stoneham. Pass Grimsby’s, up Pond Street to Spot Pond and right to pass the zoo, pass Friendly’s, and continue on Park Street to a set of lights. Turn left on to Marble Street which becomes Forest Street as you head over I93 and look for the water stop at Eugene Drive. The Rest of the Short Route: Continue on Forest Street into Winchester, turn left on Highland Ave, passing by Winchester Hospital. You’ll take your fifteenth right onto Eaton Street, a short side street at a corner with a little park. Eaton will bring you down to Washington where you’ll turn right. When you come to the Gingerbread Construction Company turn right onto Forest Street and head back up to the water stop at Eugene. After that water street head back the way you came. Run over I93, turn right at the first set of lights at Park Street, continue past Friendly’s, past Stone Zoo, left on Pond Street, down past Grimsby’s along Wyoming to a left on Main Street to finish things up. You Long Runners: Continue on Forest Street into Winchester, turning left on Highland Ave. You’ll run the full length of Highland Ave where you’ll find a water stop. After the second stop turn left on Main Street Rte 38 into Medford. Move to the right side of the road and turn right onto Playstead Rd along Oak Grove Cemetery. Playstead will take you to High Street Rte 60. Turn right over the commuter rail near the Dunkin Donuts (if you need to use a restroom, now’s your chance). Follow High Street, bearing right at a slight fork. You’ll come to the Mystic Lakes where you turn right at Mystic Valley Parkway (don’t cross the bridge into Arlington or I’ll never find you!). Mystic Valley Parkway will run along the Mystic Lakes. At what seems to be the end of Mystic Valley Parkway turn right onto Bacon Street, then take your first left back on to Mystic Valley Parkway. Along that road you’ll find another water stop, you’re halfway there. After the third water stop you’ll continue along Mystic Valley Parkway, turning left at the second set of lights onto Washington Street. Continue through a 5 way intersection crossing Mt Vernon Street and bearing right to stay on Washington Street. Washington will take you over to the Gingerbread Construction Company where you’ll turn right onto Forest Street. Head back up Forest and find the water stop at Eugene Drive again. After the fourth water stop take Forest over I93, turn right at the lights onto Park Street and turn right again at Friendly’s onto Main Street Rt28 to run along the backside of Spot Pond. Turn left at Elm Street up to the rotary at Highland Ave. Turn right onto Highland and look for a water stop in the regular spot. After the fifth water stop run along this Highland to the traffic circle at the Fellsway East. Turn left there and take the Fellsway East through the hills to Grimsby’s. Turn right onto West Wyoming and a left at Main Street to finish up your 20 miles. The Water Stops: Hank will be helping again at Eugene. A combination of Courtney, Rob, and I will be manning all the other stops as I try hard to stay out of the cold. The Roll Call. I guess we can start that now. Who’s in? Last week over 60 runners headed out to Stoneham for a long run around the snow banks. This week, after days in the 50s, 60s, and 70s, a lot of the snow is gone, but maybe not enough of it. We’re scheduled for an 18 miler that includes a loop in Breakheart. We may have to make alternate plans, and if you’ve been to breakheart in the past 24 hours or so, let me know what it’s like in there. For now we’ll plan that all is well and we can keep to the route. On tap is 18 miles for the long run, 9 for the half. We’ll head up Main Street to Ell Pond where we’ll say hi to the Clarence DeMar monument honoring the best marathoner from Melrose for a little long run luck. Merge on to Green and then turn right at the lights on to LynnFells Parkway. Run all the way to the Saugus entrance to Breakheart and find a water stop there. After the water stop head into Breakheart and do whatever you can for 3 miles before coming back to the water stop. After that head back onto the LynnFells Parkway back towards Melrose. If you’re running short turn left on Green and back onto Main to finish up your 9 miles. Running long, turn right at the first set of lights at Main Street in Saugus. Continue on Main Street as it becomes Farm Street. Take another water break at Wakefield High School. This is where you’ll stay right of the gas station on to Lowell Street. This will bring you up to Lake Quannapowitt. Go right at the lake, heading counterclockwise around the lake. Look for a water stop near the Comverse parking lot. Continue around the lake with a left on to North Ave and another left on Church Street. Take a right on Common Street and merge on to Main Street. Stop for more water at Nick’s Pizza. After Nick’s continue on Main Street in to Melrose to finish at Brueggers. As far as water stops are concerned, I think Hank, Tom and I will be able to cover the 5 stops. Despite the snow, over 40 people showed up to get in their long training run, much to the dismay of local residents. Their concern for why someone would go running in this weather is loudly displayed from people that would go driving in this weather or would go stand in their driveway in this weather. To all of them I have one thing to say: if you’d shovel your sidewalks we wouldn’t have to be running in the street! This is a refresher week from last week’s long, hilly, snowy run. This week takes us back to the sight of the infamous Rob vs the Snowplow Driver incident of 2015. We’ll leave Brueggers at 8AM on Sunday and head north on Main Street to Franklin Street, as we did last week. We’ll turn left on Franklin and run into Stoneham, like we did last week. Unlike last week you’ll run all the way to Main Street in Stoneham Center and turn left there. Run up to Friendly’s (or maybe what used to be Friendly’s?) and I’ll be waiting there with a water stop. After the water stop, if you’re running the half route, turn left at the lights and head past the Zoo, along the front side of Spot Pond, turning left on Pond Street down to Grimsby’s. Turn left onto the LynnFells Parkway, run up past Melrose High School, right on Melrose and right on Main to finish up with 7+ miles at Brueggers. Longer route runners will run continue straight on Main Street Rt 28 along the backside of Spot Pond. Turn left at Elm and head up to the rotary at Highland Ave. Unlike last week you’ll turn right on Highland Ave and continue along Highland looking for a water stop near the traffic circle at the Fellsway East. After the water stop turn left on the Fellsway East, travel through the hills to Grimsby’s and turn left there, up Pond Street back to Spot Pond. Turn right at the pond and head past the Stone Zoo, back to Friendly’s for the final water stop. After this stop continue down Main Street back to Franklin. Turn right on Franklin, right on Main, and finish up at Brueggers for 14+ miles. I believe a combination of Hank, Tom, and I will be out making sure you’re adequately hydrated. See you Sunday! Roll Call! Who’s in? Last week I counted 64 runners leaving Brueggers heading out for their wandering half route through Melrose or their jaunt to Breakheart. That was easily a record for SLR participation. As the day started with a record it also ended with a flurry of records broken in an initially irritating but ultimately thrilling Super Bowl in which the local team brought home another trophy! This week there won’t be any trophies but I’ll tell you what there will be… SNOW! A blizzard dropped a foot of snow in the area, and Saturday morning we awake to even more. There will be snow Sunday too, but I think it won’t start until after we finish so we’ll be sticking to the route as planned. 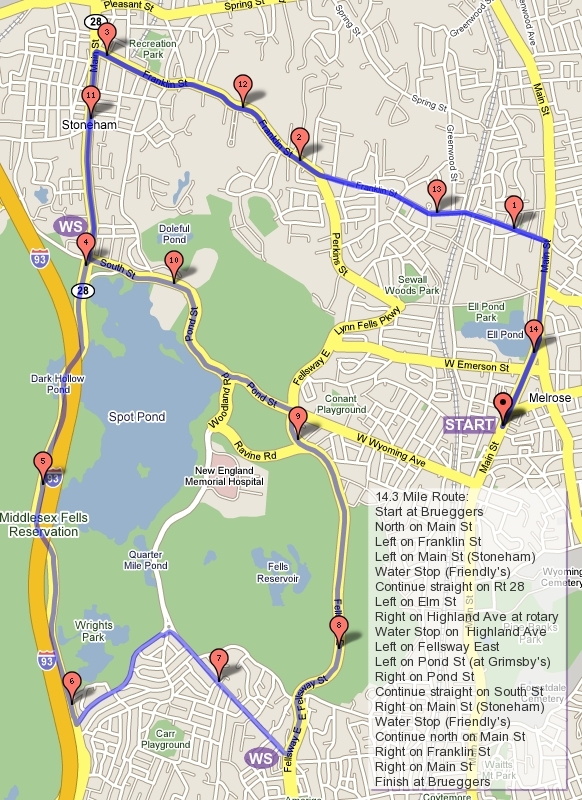 The route starts up Main Street, past Ell Pond, past Whole Foods, to Franklin Street where you’ll take a left. Follow Franklin all the way into Stoneham, past Stoneham High School and Dunkin Donuts until you hit a traffic light at the intersection of Summer Street, turn left there. Follow Summer Street, staying single file through this curvy, narrow stretch of road, as it turns into Marble Street. Cross Main Street in Stoneham keeping on Marble Street until it becomes Forest Street as you cross over I93 into Winchester. There you will find a water stop on your left on Eugene Drive where it meets Forest Street. If you’re running the half route you’ll turn around here, heading back along Forest Street turning right at your first set of lights onto Park Street. This will take you past the on ramp to I93, back past Friendly’s, crossing Main Street to continue over to the Stone Zoo and the front side of Spot Pond. Turn left on Pond Street to Grimsby’s where you’ll turn left onto the LynnFells Parkway. The parkway will take you to Melrose High School after which you’ll turn right on Melrose Street and right on Main Street to finish up at Brueggers with a total of 8.2 having past under your feet. Running long? You’ll leave the water stop on Forest Street into Winchester. Turn left on Highland Ave where you’ll see a blue sign with a white H on it pointing you towards Winchester Hospital. When you’re approaching the hospital (sorry about that hill) turn left onto Reservoir Road, my favorite road in all of the SLR routes. Take a gander at the beautiful houses, the Fells woods, the Winchester Reservoir, the gas lamp lights along the street. Such a nice view you may not even mind the next hill. Reservoir Road will loop you back to Highland Ave. Turn left and continue along Highland. You’ll come to a 5 way intersection that you’ll run straight across. Straight! Keeping on Highland where two more hills will take you to the next water stop at the end of Highland. After this stop you’ll go right onto Main Street, Rte 38, in maybe Medford, maybe Winchester. This will take you to a rotary. Follow the rotary as if you are a car, going counterclockwise, passing a little spur of a street, then exiting right to stay on Main Street. You’ll see this sign for the Symmes Farm where you’re supposed to turn. 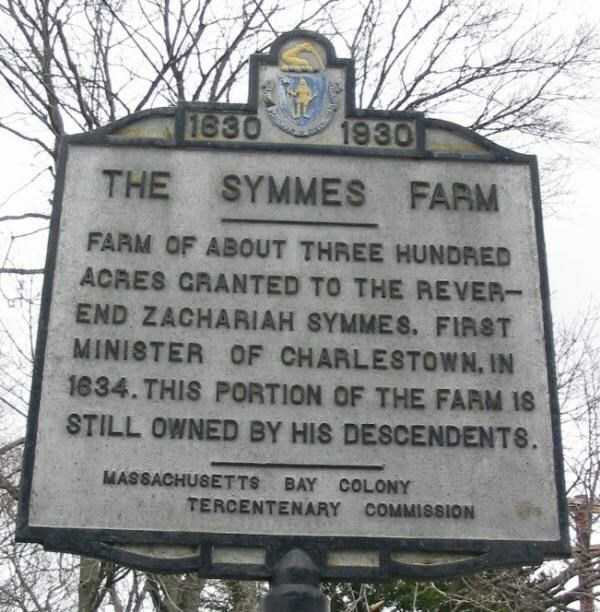 Oh, by the way, Zachariah Symmes is my 9th Great Grandfather. Anyway, keep running along Main Street until you get to a fork where you’ll stay to the right onto Washington Street. You” come to another 5-way intersection there, you’ll cross the Mystic Valley Parkway and bear right to stay on Washington Street. If you run past Winchester High School you went the wrong way. Stay on Washington Street and until you get to the Gingerbread Construction Company. This is the intersection of Washington and Forest, turn right on Forest and head back uphill to the water stop at Eugene Street. After this stop you’ll head over I93 and take a right at the lights on Park Street. This will wind you over to Friendly’s where the route turns right at Main Street in Stoneham. This will take you around the back side of Spot Pond. Turn left on Elm Street and at the end of Elm you’ll find the rotary at Woodland Ave/Highland Ave. At this rotary you want to turn left onto Woodland, continuing around Spot Pond. There will likely be one more water stop at the Flynn Hockey Rink as you come around that corner. Woodland will take you along the front side of Spot Pond where you’ll turn right on Pond Street. You’ll go straight past Grimsby’s onto West Wyoming Avenue. Follow this to the next set of lights at Main Street in Melrose, turning left to finish up at Brueggers with 16.2 miles under your snowy feet. Short cuts. If you’re looking for distances in between there are a few short cuts in the route. Please let the water stop helpers know if you’re taking a short cut so we’ll know not to wait for you at the next stop. Speaking of water stops. Its going to be cold! Hank and Tom Gorman will be helping out at water stops while I sit in my car as much as I can. Safety. Just a reminder, single file, sidewalks where you can. If the sun is behind you that means its in the eyes of the driver coming your way. Snow can be blindingly bright, don’t assume you’re seen. When running past a road with snowbanks assume the driver taking a right isn’t going to look to his right, run behind the first car waiting to exit a road. Stay safe, long runs are easier that way. That’s it for this week. Who’s in? Roll Call! Just like in football you show up and put in the maximum effort you can to make yourself the best you can be. You show that drive to improve, get stronger, build endurance, all with an eye towards that final event in which you hope to shine your brightest. Like football, last week was a quiet week, but we’ll all be back for the Super Bowl Sunday Long Run. This week’s run is 12.5 for the long runners, 6.3 for the half runners, and has options for distances in between. The group will start out running up Main Street to Ell Pond, bearing right onto Green Street, turning right on to the LynnFells Parkway, continuing to a set of lights where they’ll turn left. If you’re running short turn left on Howard Street and follow that back to Green Street. Turn right at the lights onto the LynnFells Parkway, running past Melrose High School to Grimsby’s where you’ll turn left onto West Wyoming then left on Main Street to finish up your route at Brueggers. If you’re running long you’ll keep going straight on Main Street in Saugus, continuing as it turns into Farm Street, and make your way to the water stop at Wakefield High School. After the water stop you’ll head up the hill into Breakheart where you’ll complete the outer loop. The map says go counterclockwise but I’m sure you’ll run around it however you please. Once you finish the loop head back down the hill to the water stop. Now you’ll leave the water stop continuing down Farm Street, turning left at the lights on to Water Street, then turning right on Main Street in Wakefield Center. Main Street will take you back to Melrose, back to Brueggers. I believe Hank will be assisting me with the water stops.